KARACHI – After an increase in bank robberies in Karachi, the authorities have begun thoroughly investigating private security companies whose workers have been accused of criminal involvement. Militants, especially those linked to the Tehreek-e-Taliban Pakistan (TTP), have robbed Karachi banks of US $18m (Rs. 1.6 billion) since 2009, police told Central Asia Online May 21. Some private security companies don’t verify their employees’ background before hiring, opening the door to Taliban involvement in bank robberies, security analysts and police complain. Because of the law-and-order situation in the city, businesses, banks, schools and commercial centres are hiring more private security guards, said Syed Shakoor Ahmed, a traders’ leader. “Karachi alone has more than 250 security companies with about 45,000 to 50,000 guards,” said Major (ret.) Munir Ahmed, a leader of the All Pakistan Security Agencies Association (APSAA). The demand for guards at homes and businesses is increasing and the total number of guards is growing rapidly, Munir said. But the number of cases where security guards have committed robberies is also swelling, police say. Most of the robberies, especially of banks, are due to negligence of bank staffers and collusion by private security guards, Munir told Central Asia Online. But economic and professional frustrations also undermine security guards’ honesty, some observers say, citing low wages in the industry. Militant groups have turned to bank robbery after coming under financial pressure when Pakistani authorities cut off their income sources abroad, especially those in Persian Gulf states, Central Asia Online reported in December. Pro-Taliban elements have infiltrated private security agencies meant to protect the banks, according to police. Most recently, robbers took Rs. 6.8 m (US $73,100) from a private bank in Baldia Town’s Naval Colony May 14, more than Rs. 0.7 m (US $7,500) from a bank in the Ferozabad police station’s jurisdiction May 4 and Rs. 9.5m (US $102,100) from a private bank in the Sharah-e-Faisal area, Karachi, April 24. Police haven’t ruled out inside help by security guards in those crimes, Abdullah Bhutto, a police officer, told Central Asia Online. After the increase in bank robberies, authorities have initiated an investigation of private security companies. A Karachi police Special Investigation Unit (SIU) team May 10 arrested four security guards in Orangi Town in connection with charges of possessing and supplying illegal arms to criminals as well as committing bank robberies. “Acting on a tip-off, they raided a branch of the (Shamwill) security company near Banaras Colony and arrested … Muhammad Farooq, Shameem Anwer, Muhammad Anwer and Muhammad Iqbal,” said Khurram Waris, a senior SIU officer. 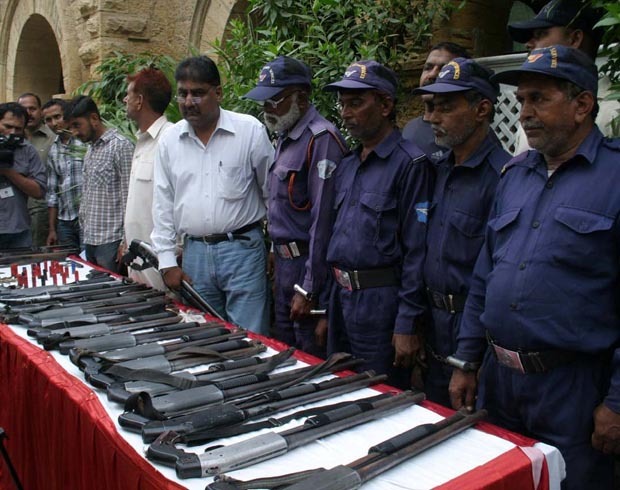 “The SIU team recovered illegal weapons, including 15 repeaters, three 7mm rifles, two pistols and a number of bullets … during the raid,” Waris told Central Asia Online. Shamwill employed unqualified personnel and supplied illegal weapons to criminals, he added. Police have sealed the Shamwill head office in the Pakistan Employees Co-operative Housing Society neighbourhood, but the owner and senior staff escaped, Waris said. The Sindh provincial government has also approached the State Bank of Pakistan to seek its assistance with verifying guards’ background, then-provincial Home Minister Manzoor Wasan said November 24. The government is deeply concerned about the growing number of bank robberies in which extremists were working as security guards, he said. APSAA has also issued a record of blacklisted security guards who were involved in theft, fraud and bank robberies. The government is working to monitor the hiring process of private security agencies to ensure they do not give jobs in Karachi to criminals and extremists, said Afzal Ali, an official in the Home Department. The Home Department is preparing a list of all such companies for prosecution and to advise all legally operating agencies to register with APSAA to minimise complications, Ali said.